Alzheimer's Took the Life of a FWM Team Member's Grandmother, but the Team Joined Together to Help Keep Her Memory Alive. This year Cuddigan Law decided to start a new Holiday tradition—giving out grocery gift cards for those in need. Like all of the best ideas, this one started off with the simple desire to help others at the holidays. But what to do? How could the law firm truly help in their community? After brainstorming, their team decided to give away $25 gift cards to Wal-Mart. The gift cards would be given out just before Thanksgiving, the idea being that the recipients could use the $25 to buy their family a turkey for their holiday meal. Since the law firm only announced their plan through their email, they were shocked when they received 60 requests. And while they were surprised, they were also excited. It seemed that they would be able to help even more people than they expected. 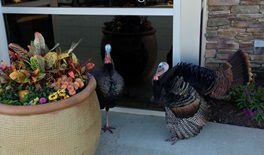 Look who showed up at the law firm the day the turkey give away was announced! The Cuddigan team was so excited about helping at Thanksgiving that they decided to do another give away to celebrate the New Year. This time, they were better prepared for the flood of entrants. They set up a page for the gift card giveaway, allowing them to more easily collect the information necessary to contact the winners. It's safe to say that Cuddigan Law has caught the charity bug, and they have plans to continue and even expand this program in coming years. When we talked with Tim and Sean Cuddigan about their charity efforts, they echoed what has become a common theme with our charity-minded clients: that they began giving in their community not for a publicity stunt, but because they saw the need and wanted to help. Period. It is this attitude of giving for the sake of giving that inspired us to highlight our clients who give of their time and money. Our team hopes that the attorneys at Cuddigan Law have inspired you to get involved in a local charity, or to begin your own giveaway as they did. If each of us give even just an hour here or a dollar there, we have the chance of starting a Giving Revolution. Viva la Giving! If you've dedicated your career to both your clients and your community, please call us at 888-886-0939 so that we can feature you as part of our Foster Gives Back client highlight series.